It is difficult to think of March without considering the effect it has on the behaviour of a usually shy and reserved British mammal. Not unlike the effect of Glastonbury Festival on sensible adults. The UK is home to three species of hare: Brown, Irish and Mountain, although it is easy to go for years without seeing any, unlike their widely spread rabbit relatives. Mating season is the period when they let their guard down, and so you are more likely to spot them. In Britain, you are most likely to spot the Brown hare, which inhabits arable farmland, and open fields of grass. The best time to look for them is first thing in the morning, or in the early evenings. Usually a solitary creature, its mating behaviour often results in scraps between the sexes, as females “box” unwanted males away. If you’re lucky, you might seen a full blown fight, where hares stand on their hind legs to have a good scrap with their front paws. The brown hare is similar in shape to the rabbit, but longer-limbed, and with lengthy black-tipped ears. They are much larger in size, weighing up to 5kg. They are also Britain’s fastest land animal, running up to 40mph. 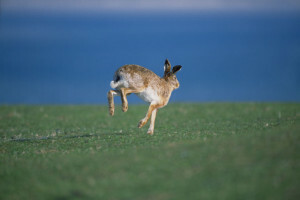 Whilst most of their “mad march” behaviour occurs in open fields, during the daytime hares like to use woodland and hedgerows as resting places, or otherwise relax in depressions in earth or grass known as forms. With ears pressed tightly against their bodies, they are well-hidden against the British landscape. To view Brown hares in the wild, the National Trust recommends visits to properties such as Lyme Park in Cheshire, and Buscot and Coleshill Estate in Oxfordshire. 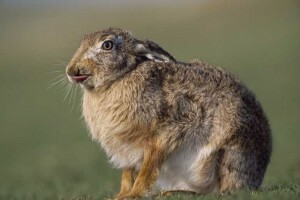 Despite the excitement of hare watching in March, the Wildlife Trust has recently released figures that suggest all is not well for British hares. According to their latest survey, hare numbers have fallen by 75% in the last fifty years. The Trust has created a list of recommendations for land-owners to boost the hare population, such as sowing grass and planting hedgerows. Many local Wildlife Trust groups run courses and volunteer schemes in hedge laying, so check out your local website.